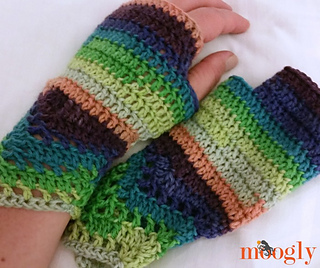 One of my first patterns on Moogly was the Chevron Lace Wrap - and I’m delighted to see that people are still making it! 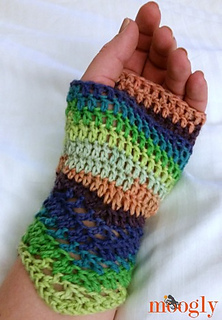 And recently I got a request for matching crochet fingerless gloves - and I thought that was a great idea. 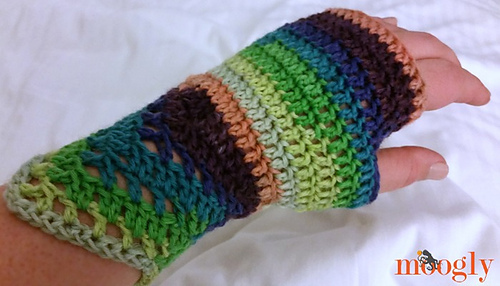 I’ve been traveling, and these were made on the road, photographed in a hotel room… and came in very handy when there was a sudden drop in the temperature! I used a fun self striping DK weight yarn - and since there’s lots of the skein left over, you can look forward to another pattern using it soon! Updated 11/17/14 with a crochet symbol chart for the first 5 rounds.